How far would you go to save fur? We all know that the Goldendoodles are among the designer dog breeds with the cutest fur in the world. They’re smart, loyal, social, and highly trainable. They truly bring out the best of both dog worlds – the world of the Golden Retrievers and that of the Poodles. To care for the coats of our furry friends then, we should feed them right. We only choose the best dog food. Unfortunately, Goldendoodles have sensitive stomachs. Often, deep-chested dogs like them experience gastric dilatation-volvulus, which is commonly known as bloat. This happens when owners feed them one big meal, followed by a large water intake. Regardless of the food quality, gastric torsions do happen. The remedy lies in the feeding procedure. Be aware and let’s do our share, fellow dog parents. Doing our part also implies knowing that Goldendoodles are prone to food allergies, like any other dog breed. Read the label as you carefully pick the right food treat for your golden pal. Here is our list of the best food for your beloved dog. 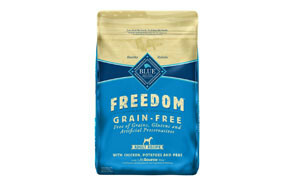 The Goldendoodle in your life will love this feast prepared by Blue Buffalo as it comes with the proven nutrient and flavorful goodness of real chicken mixed with fresh wholesome grains, lentils, vegetables, and fruits. It’s the best dog food for Goldendoodles, especially those that have parents that have histories of sensitivities to cereal grains. The grain-free formulation of this Goldendoodle dog food features the right blend of calories for energy, animal proteins for easier digestibility and amino acid completeness, and the right amounts of healthy essential fatty acids for improved immunity and skin and coat health. The addition of probiotic strains also helps ensure every bit of nutrient is absorbed by your Goldendoodle. Now that’s what you call a golden diet for a golden hound. 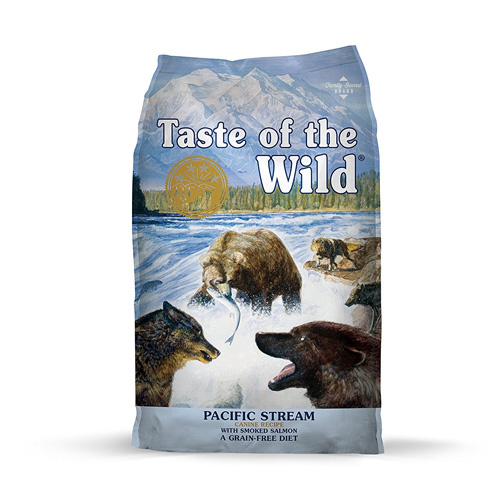 It’s the taste of the wild that your Goldendoodle will surely crave for. It’s got the full flavors of savory salmon and delicate ocean fish to give your hybrid a rich supply of essential fatty acids for more robust skin and coat. The K9 Strain probiotic formulation of this Goldendoodle food is also perfect for ensuring that the nutrients present in your dog’s tummy are absorbed for its cells and tissues to utilize. Pet parents say this is the best food for Goldendoodle because of the unique blend of antioxidants and other health-giving substances that promote general well-being in your pet and optimizing every boy organ system in its body. It’s a Goldendoodle diet that’s focused on the goodness of the sea. Your Goldendoodle is a product of two of the planet’s well-loved breeds. As only the best biologically appropriate Goldendoodle dog food will suffice to make sure that it grows to be as healthy as its purebred parents. 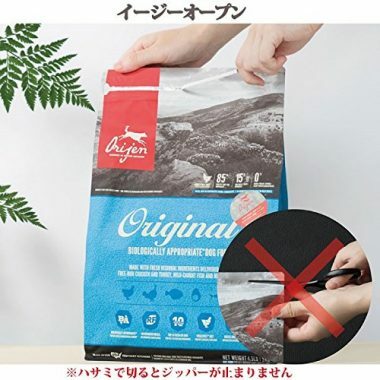 With the remarkable taste of beef, wild boar, lamb, goat, and pork as well as the health-giving goodness of essential fatty acid-rich mackerel and herring, this Taste of the Wild creation is clearly what Mother Nature intends for your pet. Wholesome veggies and grains, as well as fruits and lentils, add their antioxidant minerals and vitamins to give your Goldendoodle all the chances it needs to grow into a respectable and truly well-rounded hound. 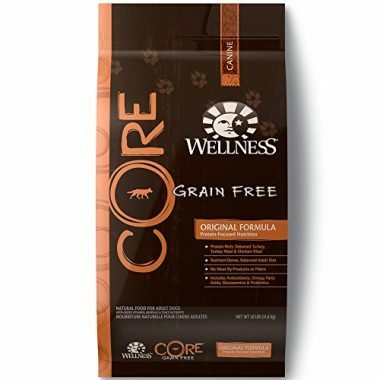 You can always rely on Wellness to give you the best dog food for Goldendoodles with its Original formulation that features the time-tested recipe of turkey and chicken sans fillers and meat byproducts. Your Goldendoodle will only be treated to the rich antioxidants, probiotics, amino acids, essential fatty acids, and even glucosamine that will help ensure healthier body and mind for your dog. Its high-protein and the high-calorie formula is perfect for happy and fun-loving Goldendoodles, allowing them to breeze through training, socialization, exercise, and playtime with all that energy. With a good balance of animal proteins, wholesome carbs, and healthy fats, this Goldendoodle food is simply what core nutrition for dogs should be. 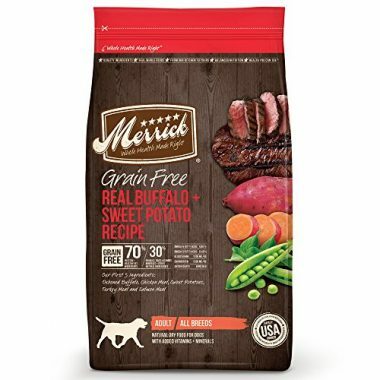 With premium-quality animal ingredients accounting for 70% of its ingredient composition, this Merrick Goldendoodle dog food is great for maintaining the strength and tonicity of your pet’s muscles and for ensuring the optimum functioning of its various organ systems. Every kibble is bursting with flavors derived from real buffalo and blended with chicken, turkey, salmon, lamb, and beef. Completing the nutrient profile of this grain-free formulation are fresh farm produce that not only give your dog the antioxidants it needs, but also the fiber that will help keep gut function at its optimum. The absence of gluten ingredients is welcome news for those who would like to ensure optimum digestion for their Goldendoodles. Like all elderly dogs, your senior Goldendoodle will require a different diet that is tailored to its changing physiology. 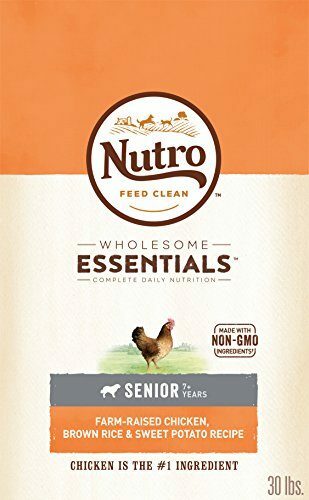 Nutro’s Wholesome Essentials makes its way as one of the best food for Goldendoodle seniors by giving them slightly lower calories per serving as well as slightly lower proteins. Nutro’s senior Goldendoodle dog food recipe also integrates nutrients needed for alleviating any beginning symptoms of aging joints such as arthritis. The addition of easily digestible proteins and carbs will also not tax the aging digestive tract while making sure that each nutrient contained in the Goldendoodle food is adequately absorbed and utilized. The antioxidant-rich recipe is just perfect for keeping your elderly pet’s immune system fully functioning. Senior dogs typically lose some of their taste buds that they can no longer appreciate simple flavors delivered by kibbles. Some may no longer have a complete set of teeth to munch on kibbles. If this is what is plaguing your senior Goldendoodle, then Blue Buffalo’s wet food formulation for senior dogs should be a great choice. 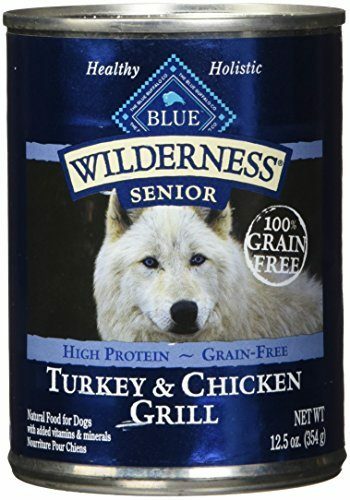 Not only does it come in a delicious grilled turkey and chicken flavor that will greatly improve your elderly Goldendoodle’s appetite, but it also comes with excellent amounts of proteins to maintain the integrity and functioning of its muscles. It also comes with enough calories to make sure your senior Goldendoodle will still be able to maintain its highly active lifestyle. 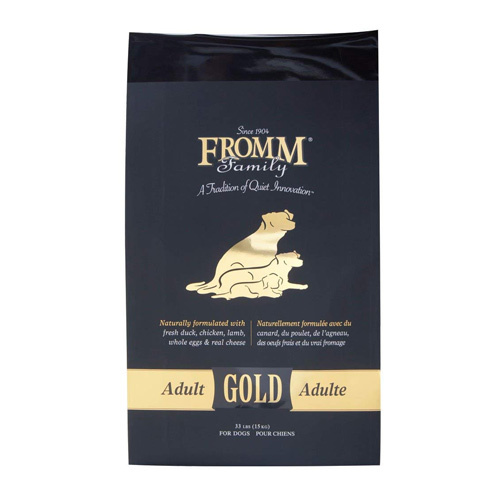 Known for their gourmet canine recipes, Fromm Family is bringing to the dog food bowl its Gold Nutritionals adult recipe to make sure that your Goldendoodle will have all the necessary nutrients it needs to maintain and strengthen its immune system, digestive health, and integumentary functioning. With real chicken forming the core of this Goldendoodle dog food made even more nutritious by the addition of duck, lamb, real cheese, and whole eggs your playful and loyal companion will have the highest possible quality of proteins to ensure the optimal functioning of its muscles, hormones, and immunoglobulins. This Goldendoodle food is more like a recipe that comes straight from your very own kitchen. 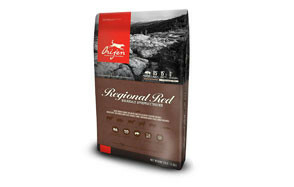 Seniors and puppies aren’t the only ones in need of premium quality wet dog food. 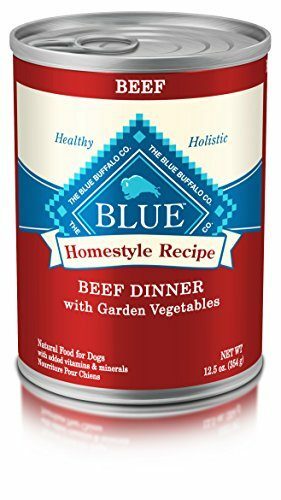 Even your adult Goldendoodle can greatly benefit from the nutrient-richness of Blue Buffalo’s Homestyle Recipe prepared just the way moms would cook a hearty feast for the whole family. This time, it’s definitely for your four-legged friend. 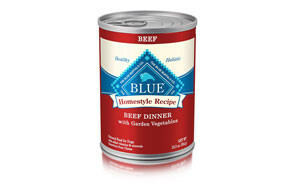 This Goldendoodle dog food features thick cuts of real beef made even more savory by the inclusion of beef liver and beef broth. Wholesome veggies are also added to give your hound more energy to go about its merry way. The amino acids integrated into the essential minerals ensure optimum functioning of a variety of tissues including your Goldendoodle’s muscles, skin, hair, brain, nerves, and a whole lot more. 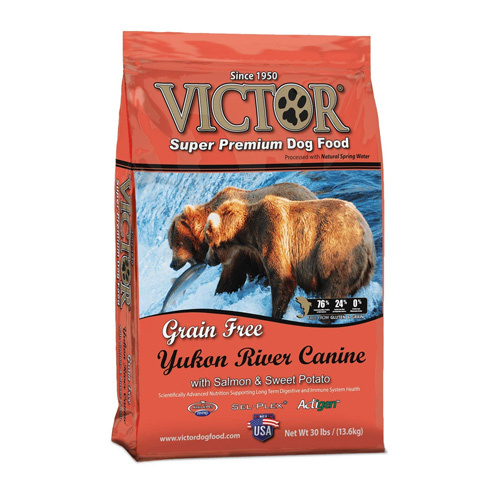 From its pet food manufacturing facility in Mount Pleasant, Texas comes Victor, a gourmet canine food brand that is quite difficult to source. But if you can get your hands on a Victor make sure to get the Yukon River with Salmon & Sweet Potato recipe. It’s a super-premium Goldendoodle dog food for your super pet. Instead of putting the usual chicken or beef, Victor puts in salmon and menhaden fish in the recipe before adding a bevy of low-glycemic but highly nutritious fruits and vegetables. The calories are just right for your fun-loving Goldendoodle while the proteins are never derived from plant ingredients. This is very much, unlike other brands that lace their recipes with plant-based proteins. What’s in a Goldendoodle’s Ideal Diet? A typical Goldendoodle can weigh anywhere between 45 pounds and 100 pounds. As such, when determining the ‘ideal’ diet for your Goldendoodle it is important to take note of its weight, age, activity level, and life stage. This will give you the number of calories that your Goldendoodle will need. Highly active Goldendoodles will require more calories than those that spend most of their days on their doggie beds or on the laps of their human masters. In addition to the right amount of calories that is commensurate to your Goldendoodle’s weight, age, and activity level, the ideal diet will also require plenty of proteins, especially from animal sources. You can say we’re a bit biased towards animal proteins, but this is not necessarily without basis. Animal-based proteins have complete essential amino acids while plant-based ingredients have some missing AAs. The gut of dogs is also more in-tune when it comes to digesting animal ingredients. Using animal ingredients also provides healthier fats for your Goldendoodle, especially if salmon, herring, mackerel, or any other fatty fish is included. These healthy fats should include omega-3s and omega-6s. However, we have to caution you about going for more omega-6 fatty acids in relation to omega-3s as it can have the opposite effect of triggering a host of inflammatory reactions instead of protecting your pet against inflammation. Ideally, the ratio of these essential fatty acids should be at least 4:1, that’s omega-6 to omega 3. The closer you can bring the ratio to an ideal 1:1, the better it is for your Goldendoodle. Vegetables and fruits are also important for your Goldendoodle as these provide minerals and vitamins that can support many of the physiologic processes in its body. We don’t recommend going for dog food that contains allergenic cereals like corn, wheat, or soy. We also would like to caution you about giving too many potatoes and rice to your dog as these are high glycemic foods that can be a great risk factor for diabetes. Glucosamine and chondroitin, as well as the correct ratio of calcium and phosphorus, are also needed by a Goldendoodle, especially those that weigh above 50 pounds. The weight of their body can put a substantial strain on their joints so it would be wise to give them the structural elements needed for healthier and stronger joints. When it comes to the nutrition of your Goldendoodle puppy, only the best dog food for Goldendoodle puppy will suffice. Unfortunately, given the fact that the Goldendoodle is not purebred you will never find a dog food that is specifically tailored for your Goldendoodle puppy. As such, what you can do is to look for dog foods that are specially formulated for either Golden retrievers or Poodles. Otherwise, you’d have to pay attention to the unique nutritional requirements of a crossbreed. While searching for the best puppy food for Goldendoodle is important, it is equally crucial to know how to feed your pup. Your puppy’s nutrition should first come from its mom since mommy’s milk is rich with all the nutrients and antibodies that young puppies need. By around 6 weeks of age, you can then start introducing milk replacers and solid foods while slowly weaning your puppy from its mommy’s milk. By the time it reaches 8 weeks of age and weighs about 6 pounds, you will need to give your pup about 280 calories every day, divided into 3 to 4 meals. Once your Golden doodle reaches the age of 16 weeks or about 12 pounds, its calorie requirements can be increased to about 490 calories divided into 3 meals per day. Goldendoodle puppies reaching the age of 6 months can already be given their meals at the same frequency as adults, which is twice a day. However, to help minimize bloat or gastric dilatation volvulus, we’d recommend going or smaller yet more frequent feedings. Grapes and almonds should never be given to your Goldendoodle no matter how much it begs you to do so. Chocolates and candies, as well as other treats and food items that contain xylitol and caffeine, should also be avoided. Onions and garlic are also not advisable to be given to your Goldendoodle or any other dog for that matter. Goldendoodles can grow old up to 15 years, but only if they are able to maintain their excellent level of health. Lack of exercise and poor Goldendoodle diet can significantly reduce their lifespan by making them more prone to the development or occurrence of health problems. Goldendoodles are prone to the development of hip dysplasia which can be made worse by their weight as this can increase the pressure in the already-damaged hip joints. 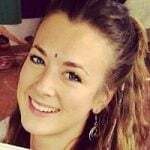 They are also susceptible to allergic skin disease which can be brought about by a variety of causes which will often require a thorough work-up. Some Goldendoodles are also known for developing patellar luxation in which the kneecap slips out of its normal anatomical position. Aside from these health conditions, Goldendoodles can also be affected by Von Willebrand’s Disease, progressive retinal atrophy, epilepsy, diabetes, degenerative myelopathy, bloat or gastric dilatation volvulus, and corneal dystrophy, among others. 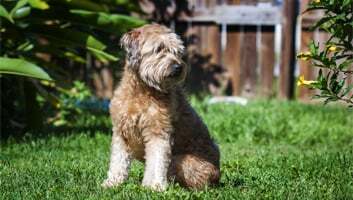 It is always wise to ask the Goldendoodle breeder for information regarding the dog’s parentage and whether its parents have had any of these diseases in their lifetime. Otherwise, you can always seek a comprehensive DNA testing to identify genetic markers for canine diseases. 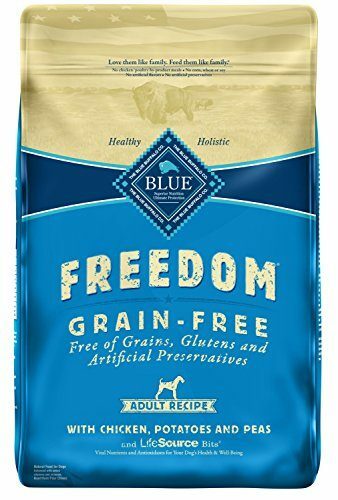 We picked Blue Buffalo’s Freedom Adult Recipe as our best dog food for Goldendoodles because of the good combination of calories, proteins, and fats that are necessary to ensure adequate energy and optimal tissue-building and maintenance. It is easily digested and comes in just the right size of kibbles for your pet. The probiotics, amino acids, omega fatty acids, glucosamine, and antioxidants all work together to ensure a healthier, happier Goldendoodle. Ensuring your Goldendoodle grows up to be a well-rounded, healthy, and happy dog is every pet parent’s dream. By starting with the right nutrition for Goldendoodles you can help secure their healthier and happier future.